The first full day of the state of emergency in Baltimore found Maryland Gov. 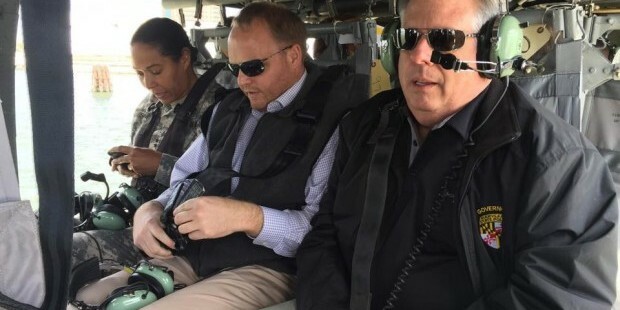 Larry Hogan aggressively occupying the city and walking its streets from the wee hours of the morning, and Mayor Stephanie Rawlings-Blake pretty much pretending he doesn’t exist. Just blocks away, they didn’t appear together, and talked by phone and through aides. Friction between Maryland’s governor and the mayor of its largest city has been common in the past administrations, even when both are Democrats. Hogan has once again cleared his daily schedule of official business in Annapolis, including skipping a planned Board of Public Works meeting Wednesday. The entire 158-page agenda for the meeting to approve millions in contracts was scrapped except for the annual setting of the state property tax as required by law. That will be handled by State Treasurer Nancy Kopp and Comptroller Peter Franchot on their own. No increase is planned, so Hogan has no need to block it. Baltimore’s sorry Monday afternoon and night of marauding, looting and arson — 144 torched cars, a huge new senior housing complex in ashes, $1 million worth of shoes stolen from a store and so on — was over Tuesday as 1,000 National Guard troops, hundreds of state and county police officers backed up a weary and battered Baltimore force. There was some initial problem enforcing the 10 p.m. curfew at North and Pennsylvania avenues, but recalcitrant residents dispersed after tear-gas was fired and the media scattered. Maryland governors have long had a Baltimore office, with some, like Martin O’Malley, using it more than others. The governor is after all governor of the entire state, including Baltimore, and the bulk of state employees actually work in the city, not Annapolis. That St. Paul Street office is where Hogan held meetings with community leaders, and conducted one of several news conferences Tuesday. Overall, Hogan emphasized that his role and the role of the agencies, troops and police he controls was to support Baltimore officials in restoring peace and order. He refused to be baited into saying whether the mayor had waited too long to ask for help. He did make clear again that the state and the Guard were ready to take action sooner than the mayor asked for it. Rawlings-Blake held her own press conference downtown with her police commissioner, surrounded by community leaders, with little obvious overlap with the community and religious leaders Hogan had conferred with earlier in the day. Rawlings-Blake thanked many people for their work and support. She did not thank Hogan by name or title, acknowledging the troops occupying her city but not their commander-in-chief. She asked Police Commissioner Anthony Batts to name the police agencies that had sent officers, since she couldn’t recall them. He only named a couple, even though they came from six counties, two states and the District of Columbia. In the late afternoon, Hogan’s office produced a long list of assets the state has provided the city, including the Guardsmen and the police, 37 fire trucks, engine and rescue units among other things. Rawlings-Blake likely resents the need to rely on Hogan for aid, but the governor has more important motives than a charitable impulse to help a beleaguered city and its shocked citizens. The national and international coverage of the rioting and looting of businesses seriously undermines Hogan’s broader goals of creating more jobs for the state and showing Maryland is open for business. The problems over the death of Freddie Gray had already made national news before the city exploded on Monday. National networks flocked to Baltimore to cover the disturbances and their aftermath. There were multiple segments on broadcast and cable networks, and Washington stations provided extensive coverage. Hogan has an economic development trip to Asia planned for late May and early June. Hard to imagine the Baltimore riots not being mentioned, if only behind his back. The coverage has been so widespread and intense that even the casual news consumer will have heard about Baltimore’s problems. They have even seeped into the sports world with the game Wednesday between the Orioles and the Chicago White Sox that will be played in an empty stadium for the first time anyone knows of, a bizarre and newsworthy event. 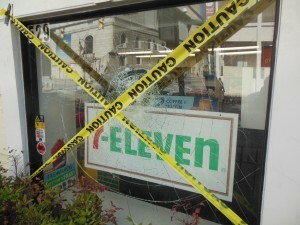 Besides the riots’ short term impact on local businesses, Baltimore’s tourism could be affected. Trade shows and conventions might take a pass on a second tier city that has had first tier civil unrest. Other businesses might have second thoughts about locating in or near a city that desperately needs new jobs and residents. Regardless of how Rawlings-Blake treats the governor as she copes with critics of her actions and the damage to her reputation, Hogan has plenty of strategic reasons to quickly restore Baltimore’s law and order and its national reputation that have little to do with whoever is in charge of City Hall.